Public EIW event to raise awareness in the former Yugoslav Republic of Macedonia. From left: Dr Venko Filipche, Minister of Health; Dr Jihane Tawilah, WHO Representative in the former Yugoslav Republic of Macedonia; Ms Mila Carovska, Minister of Labour and Social Policy (with her son); Professor Aleksandra Gzozdanova, President of the National Committee on Immunization. With immunization rates stalled and measles still circulating in some countries, EIW 2018 served as an important platform to raise awareness of the benefits and importance of maintaining high vaccination coverage. The strength of EIW lies in simultaneous action and discussion across countries, cultures and stakeholders. A diverse array of activities took place throughout the Region, targeting audiences from city squares to parliaments and from primary schools to universities. These were organized by health authorities, professional associations, civil society groups, the media and students, as well as WHO, the United Nations Children’s Fund (UNICEF) and other international partners. Engaging discussions took place on social media, as well as in clinic waiting rooms, at expert roundtables and on evening news shows, collectively reaching millions of people. EIW messages could be seen on flyers, videos, posters, t-shirts, billboards, pens and even bicycle seat covers in languages from Azeri to Uzbek. To ensure optimal impact, the week was utilized to launch reports (Denmark) and even introduce a new vaccine (Uzbekistan). A few selected examples below illustrate the diversity of activities. This year, EIW focused on vaccination as an individual right and shared responsibility. In launching EIW, Dr Zsuzsanna Jakab, WHO Regional Director for Europe, underscored that every vaccination is an opportunity for an individual to be protected, but also benefits the whole community by contributing to herd immunity. She also stressed the next steps needed to close the remaining immunity gaps in the Region, saying, “We need dedicated action to identify and address the root causes of vulnerability in our Region that allow outbreaks to persist. Over 20 000 measles cases in 2017 were a dramatic warning that we have not done enough”. Her Royal Highness The Crown Princess of Denmark, Patron of WHO/Europe, focused on the importance of vaccination as a shared responsibility: “Every one of us plays a role in achieving a healthier future for all. By ensuring ourselves and our children are vaccinated we prevent the spread of dangerous infections and by seeking and sharing credible and trustworthy information we empower ourselves and others to make the right decisions”. In Hungary, celebrities and high-level politicians were featured in a highly successful and engaging social media campaign, and in the former Yugoslav Republic of Macedonia ministers participated in a public event in a city park. Primary and secondary students and teachers in Austria were offered free vaccination to increase immunization coverage in schools and public spaces. In Bosnia and Herzegovina, an educational workshop brought together paediatricians, epidemiologists and other health-care professionals in Mostar. In Germany, a banner reading “Get vaccinated. Your protection protects me too” was distributed to pharmacies and information booths, which were set up in various cities. A university in the Russian Federation was the setting for a popular flash mob. In France, health authorities launched an informative video explaining how vaccines work. In Israel, an online chat with the chair of the Israeli Pediatric Association was organized to discuss the value of immunization for an entire community. For the first time in the Republic of Moldova, a livestreamed event on immunization was organized on one of the biggest parents’ social online platforms, Ask a Mom. The event featured expert speakers from WHO, UNICEF and the National Public Health Agency, and had an audience of 14 000. In Tajikistan, information about immunization reached the general public through television broadcasts and printed materials. In Ukraine, celebrities and medical specialists spread the word through radio and television, and the media participated in an event and press conference together with the organization Parents for Vaccination. 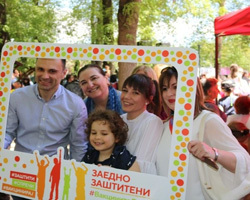 Immunization supporters dressed as superheroes, and well-known parenting bloggers also helped highlight EIW in Kyiv. Maintaining high vaccination coverage requires joint action and a unified voice. This was evident in all countries, with activities organized by a large range of stakeholders including WHO, UNICEF, Rotary and other international partners, as well as local health authorities, parent organizations, health professionals, teachers and more. Within the European Union (EU), the European Centre for Disease Prevention and Control (ECDC) launched a report on the measles situation in the EU, and the European Commission proposed a Council Recommendation to strengthen the EU cooperation on vaccine-preventable diseases. Large expert conferences, roundtable meetings and press conferences were organized, for example in the Russian Federation, Tajikistan and Ukraine. In Slovenia, the National Institute of Public Health (NIJZ) organized a conference for experts and journalists to discuss the status of vaccination in the country. In Ukraine, opinion leaders, including health-care specialists and representatives of parent and other interest groups, made a joint statement committing to unite their efforts, along with the Ministry of Health, WHO and UNICEF, to ensure that every person in Ukraine has equitable access to the benefits of immunization and to build trust in vaccines. Furthermore, EIW was used by the WHO field office in Gaziantep, Turkey, as a platform to celebrate progress and strong partnerships with UNICEF and the Syria Immunization Group (SIG) to increase immunization coverage among children in north-western Syria. In Denmark, WHO and UNICEF collaborated on a joint photo and video exhibit showcasing the importance of strong partnerships to tackle issues related to outbreaks of vaccine-preventable diseases, particularly in hard-to-reach areas as well as in the midst of humanitarian crises. WHO/Europe’s Patron, The Crown Princess of Denmark visited the exhibit prior to its official opening on 23 April and stated that vaccines are “at the heart of advancements in health protection and well-being”. EIW was also utilized to launch the introduction of inactivated polio vaccine (IPV) in Uzbekistan with support from Global Polio Eradication Initiative (GPEI) partners. A more extensive list of activities is available on the Immunize Europe Forum and will be published in the annual EIW Narrative Report.